There is a Forgot your Password? link in the login page. In there you will find multiple options to retrieve your password: via your Username or via your email address or via your PayPal in case you have used it before on our system. Use Express Checkout to process payments. Process your customers credit or debit card payments. Authorize and capture your PayPal transactions. Now, in your BitWine account go to My Profile tab and select the Payment Systems sub tab. 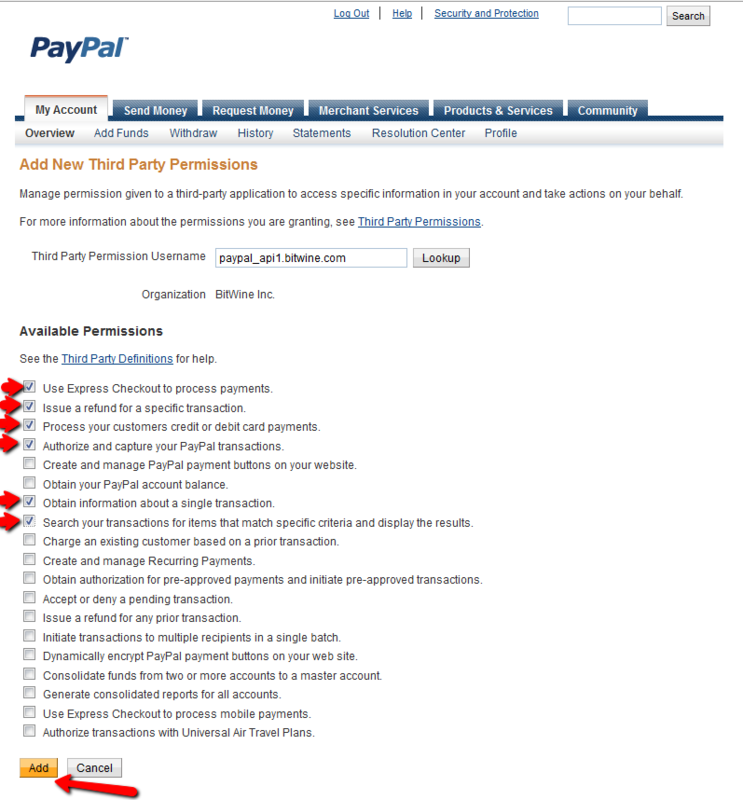 If you never set up your PayPal account before, you will see a “PayPal account Setup” button. Click it and follow instructions. However, if you did set up PayPal before, you will see an error message saying your setup is incomplete and a link to finish the setup or a link to “Verify PayPal setting”. Click the available link and follow the instructions until you get to the the API verification page. You should get a green confirmation “PayPal API Access successfully verified.”. You are now ready to charge money. Your firewall may be blocking the BitWine Taskbar from connecting to the Internet. Don’t despair, there are ways to fix this. 1. In the Norton Personal Firewall main page, click on “Status & Settings,” “Personal Firewall”, and then the “Configure” button in the bottom right-hand side of the page. 2. This will take you to a page called “Program Control.” On this page, find the “BitWine Taskbar” program, select it, and then press the “Modify” button. 3. This will give you a small window with a drop-down menu asking how you want BitWine to be treated by your Firewall. Select “Permit” from the menu, and then press the “OK” button. 4. This will bring you back to the Program Control page in step 2. Simply press the “OK” button, and the BitWine Taskbar should work fine with your Norton Personal Firewall. 1. Click on the red “M” icon in your system tray in the lower right-hand side of your desktop. Select “Open SecurityCenter” from the menu that appears. 2. On the SecurityCenter page that appears, press the “Internet & Network” option, then “Firewall Protection”, and then the “Configure” button about two-thirds of the way down the page on the right (not the one at the very bottom). 3. On the next page, press the button to the right of the “Firewall protection is enabled” selection. This will expand that section of the page. Press the “Advanced…” button that appears on the right. 4. This will pop up a new window. In this window, select the “Program Permissions” option in the left-hand menu. Then select “BitWine Taskbar” from the “Program Permissions” list. In the “Action” section of the page, press the “Grant Full Access” option, and finally the “OK” button at the bottom of the page. 1. Right-click on the ZoneAlarm icon in your System Tray and select the “Restore ZoneAlarm Security Suite Control Center” option. 2. In the ZoneAlarm Control Center, select the “Program Control” menu on the left and click the “Programs” tab on the upper-right. Find the “BitWine Taskbar” program in the programs list, and then select the “Allow” option in the “Trusted” column. 3. And finally, select the “Allow” option in the “Internet” column. Now you should be ready to use BitWine with ZoneAlarm!